Franchisors are busy bees for whom every business challenge is multiplied by the sheer number of franchisees and business locations, even more when dealing with ubiquitous media like the internet and fast-evolving trends such as social media or mobile technologies. 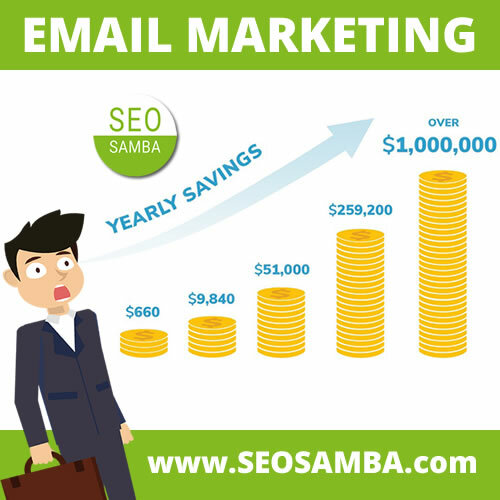 Which brings us to our question of the day, and the subject of SeoSamba’s Top 250 Business Services Franchise Digital Marketing Performance Report 2016. 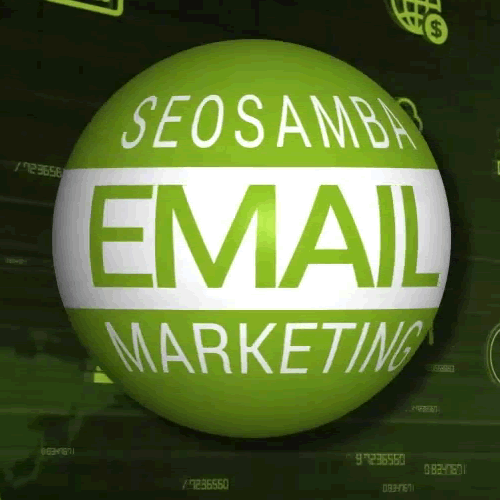 In this exclusive report, SeoSamba analyzes the latest trends, strategies, and challenges of digital marketing for franchising leaders of the U.S. domestic business services market. 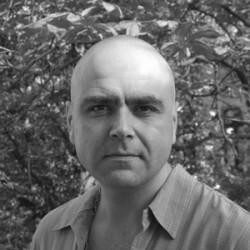 How good are business services franchises at online marketing in 2016? 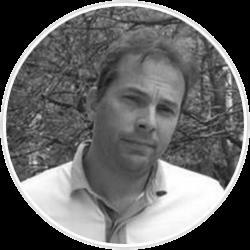 More specifically, how do franchisors cope with the many basic requirements of a sound franchise online marketing strategy, both at the global (franchise-wide) and local (franchisees) levels? 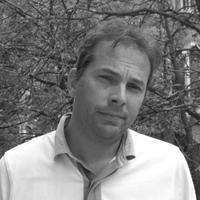 If you read the various authoritative studies on the subject, you’ve mostly heard a certain level of self-satisfaction from both franchisors and franchisees regarding their own marketing undertakings, yet they judge each other much more severely when asked if satisfied with their counterpart’s contribution to the overall efforts. This is known as the “franchisor/franchisee gap”, a widespread ailment in the franchising world that highlights the abysmal chasm between what franchisors offer and what franchisees expect in terms of online marketing, an idiosyncratic syndrome we’ve ourselves called the elephant in the franchise digital marketing room. Hence our choice, rather than surveying franchise marketing chiefs and local franchise owners, to study the online presence of the Top 250 Business Services Franchises and of their local franchisees in those areas that matter most: content, SEO, localization, social media, analytics, and mobile. Although 72.7% of Top 250 business services franchises have some news or blog platform in place on their website, but over of third of those do not publish anything in a whole month or more. 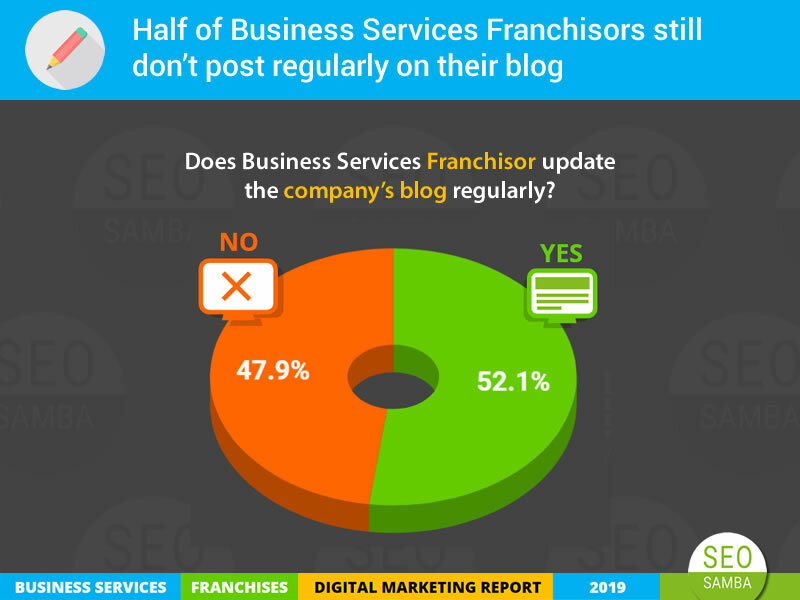 Simply put, between franchises that don’t have a blog or news in place (20.5%) and those that don’t update them at least once a month (22.7%), close to half of Top 250 business services franchises create little or no content, other than purely commercial. An overwhelming 71.7% of Top 250 Business Services Franchises do not provide any type of blogging or news platform, barring franchisees from any regular content update and forcing them to come up with their own blog or news setup. Only 6.5% of Top 250 Business Services Franchises provide a “Mixed” setup with a blog and news platform integrating corporate updates and global content from the franchisor supplemented by timely local messages and advertisements relevant to the local franchisees. 74.3% of the Top 250 Business Services Franchises provide some kind of online presence for their franchisees on their corporate website, helping them get more exposure and an immediate, visible incentive for their marketing fees. The fact that over one in four franchisors won’t spend the effort in doing so is actually quite puzzling, and prompts serious doubts about any potential franchise development in the near future. While having an online presence on the main franchise website is not as crucial for all franchisees, the overall number of units within the franchise seems to be the defining parameter for Top 250 Business Services Franchises. 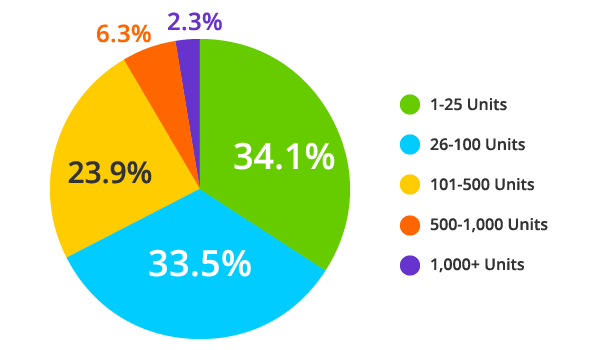 This pie chart below reminds us of the challenges of scaling a business services brand, with only 1/3 of the top 250 franchising business service brands count over 100 units in 2015. 39.2% franchisors only provide a “single page” type of presence, many of whom barely qualifies as real value, albeit often limited, with outdated or incorrect information. On the other hand, 36.9% of Top 250 Business Services Franchises have put a real online marketing strategy in place by providing a full-fledged presence and a well-developed website. 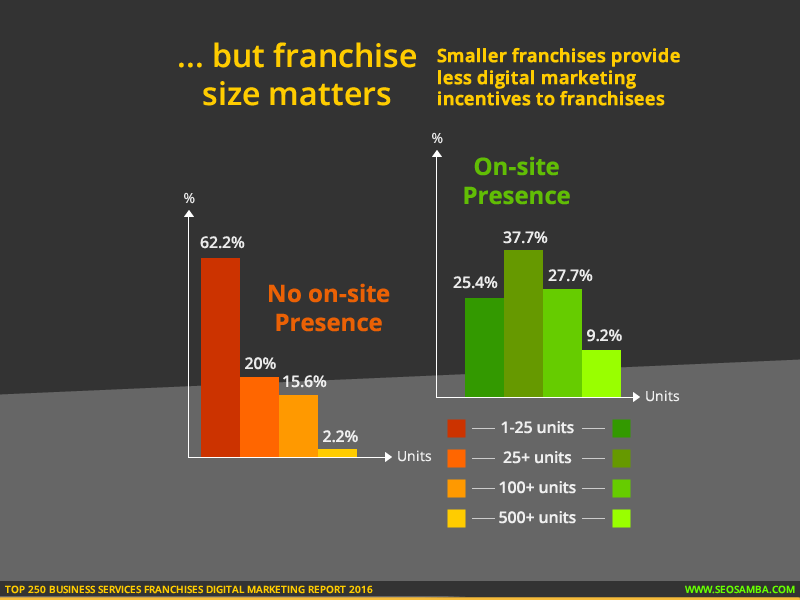 As you'll see in the full version of our report, in that area franchise size is not a predominant factor, hence not much of an excuse for overlooking franchisees' online presence on the main franchisor website. Facebook being by far the number one social network of choice for franchisors, 79.1% of Top 250 Business Services Franchises spend sizeable amounts of time and energy to regularly update their pages with information and news, much more so than their own corporate blog. There is still a mind-blowing 20.9% of Top 250 Business Services Franchises who seemingly think that updating their Facebook status and communicate on social networks with end customers, franchisees and prospects at least once a month is not worth their time. As our Top 250 Business Services Franchises Digital Marketing Performance Report 2016 shows, this proportion is even dramatically worse for other major social networks such as Twitter or LinkedIn. 73.7% of the Top 250 Business Services Franchises are mobile-friendly according to the Google Mobile-Friendly Website Test. Franchises have taken strong steps to cater to their roaming visitors, but the proportion of non-compliant websites (25.1%) is still somewhat alarming given the prominence of the sample studied. This is unfortunate as, According to Google, 61% of mobile visitors will leave a website immediately if the experience is too frustrating, while 67% of users are more likely to buy or convert on websites providing a satisfying mobile experience. Thanks for reading this summary. 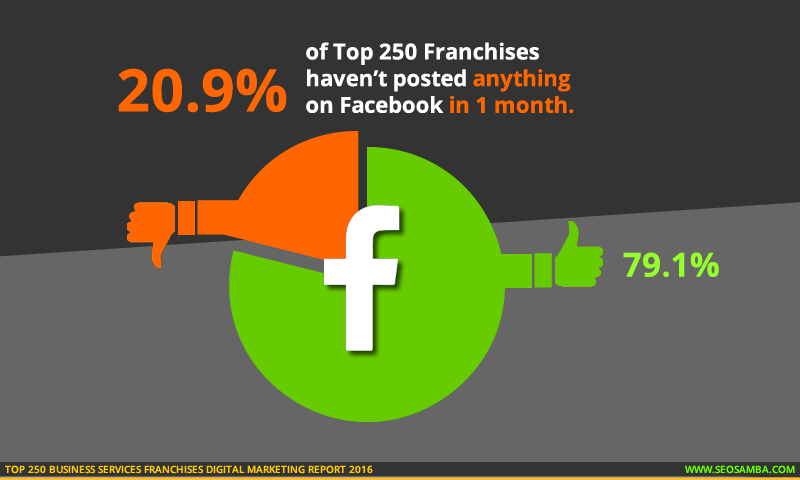 To uncover more data, stats and findings as well as our analysis of how these facts impact the overall online strategies of leading franchisors, please click the button to download for FREE the full version (PDF) of our Top 250 Business Services Franchises Digital Marketing Performance Report 2016.